Goulash is a stew or soup made with meat, vegetables andpotatoes. 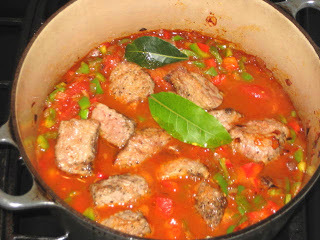 In Hungary, it is lot closer to soup then a stew and it doesn’tcontain tomatoes. There are many versions in former states of AustrianHungarian Empire. In Czech Republic and Slovakia the liquid base is choppedtomatoes and it is served with either bread or BreadDumplings, in Austria it is served with rye bread and in Northern Italywith spaetzle or gnocchi. 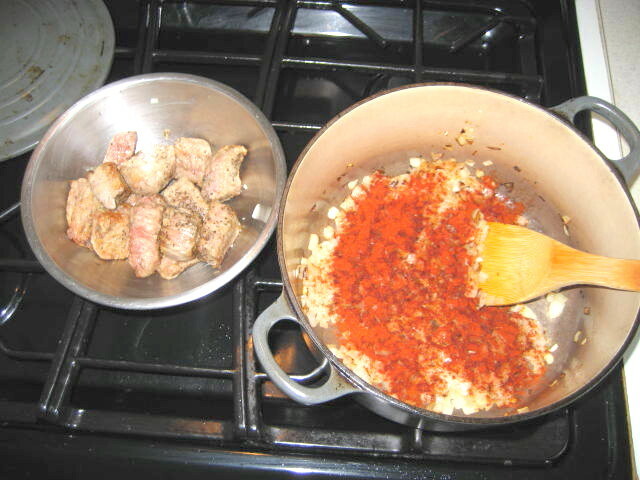 However, one ingredient that is constant right acrosswhole former Empire is paprika, and lots of it. Also, in Czech version, thereare as many onions as there is meat, by weight, and green and/or red peppersare always included and potatoes are seldom cooked in goulash itself but ratheron side if used as side dish. 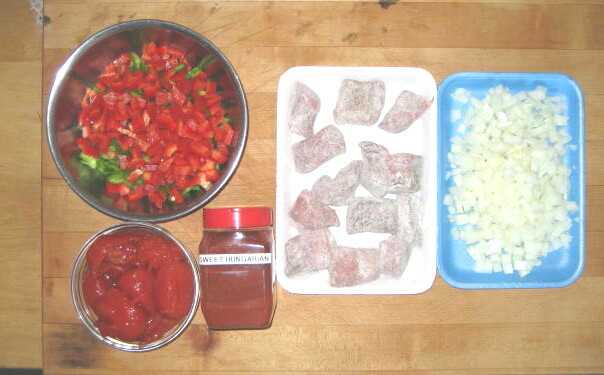 As is the case with every national dish there are manyregional varieties. 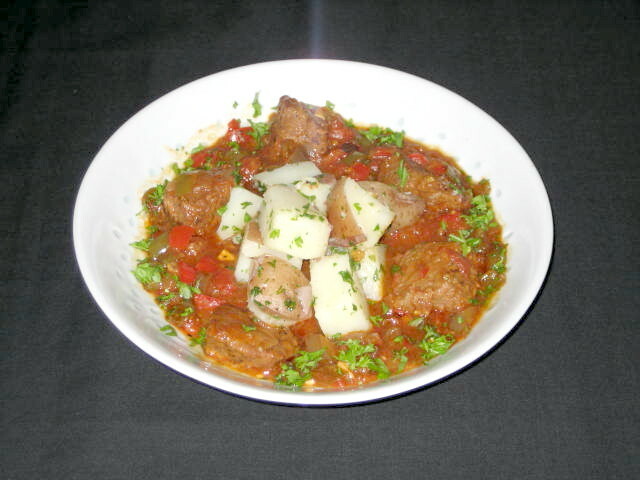 Szeged goulash is made with pork, some potatoes are replaced with sauerkraut and sour cream is added at the end of cooking. Znojemský(Moravian) Goulash is made with beef, onions, peppers and chopped pickles.In short, there are as many varieties as there are regions. In this post I willdeal with a basic beef goulash using tomatoes and with potatoes on the side. Place flour and beef inside plastic bag, close it and shakethe beef until all sides are evenly coated with flour. Shake off all excessflour and set aside. Heat up lard or oil in heavy pan or Dutch oven on high heat.Place the beef cubes in lard, leaving space in between, and brown on all sides.Remove beef to bowl and set aside. The beef will release some juice. Pour off the lard leaving just a thin coat on the bottom. Lowerthe heat to medium, drop in the onions and garlic and cook till light goldenbrown. Off the heat sprinkle the paprika and caraway seeds on topand then mix until onions are evenly coated. Put back on medium heat, add peppers and tomatoes with itsjuices, stir and bring to simmer. Put back the beef with collected juice, bay leaf and blackpepper. Bring back to simmer on medium high, lower the heat to low and simmer,stirring and scraping the bottom every 15 minutes or so. Braise for 3 hours making sure that there is enough liquid. Iftoo dry add some liquid such as beer, wine or stock. Otheroption is to cook the goulash in the 350 °F oven.10 minutes before serving add marjoram and adjust seasoning(salt, cayenne pepper). Serve in preheated shallow bowl with potatoes, pasta, breaddumplings or just slices of rye bread. As is the case with many stews, this goulash taste betterwhen reheated next day and when served with a different side you end up with a new meal. Beef is already coated in flour. Meat is browned, onions and garlic are cooked and paprikaand caraway seeds are mixed in. 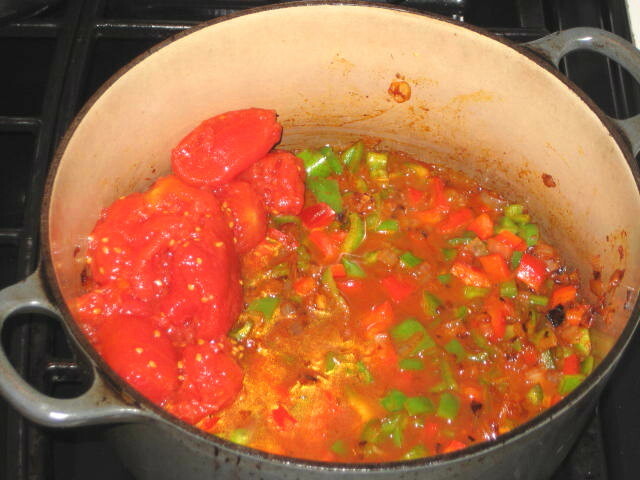 Peppers, tomatoes with its juice are added and brought backto simmer. Beef is returned to pot with bay leaves, pot is covered and slowlybraised for 3 hours.